When it comes to keeping your house up to date, most features in need of repair or renovation are visible, and therefore you know when the work is necessary; shingles may be missing from the roof, paint may be scuffed or chipping on the walls, watermarks may be appearing on the ceiling from the bathroom upstairs. But when it comes to outdated or damaged electric wiring, everything is hidden out of sight. Ironically, electricity is one of the most powerful and potentially dangerous factors of a home’s composition; and for far too many people, “out of sight, out of mind” creates the perfect scenario for dangerous electrical fires. As time goes by, especially in our dry Las Vegas climate, the electric wires have a tendency to become brittle and weak. When there is any disturbance or movement such as a small rodent might cause, the wires can shift and the insulation crumbles or breaks, exposing the wire’s surroundings to the current of electricity. Older homes were built at a time when the use of electrical devices were significantly lower. Consequently, most homes were built with fewer electric outlets, many of which only having reciprocals for two-pronged cords rather than for three. Because of this, power strips are used to accommodate the demands of modern lifestyles. This often results in overloading as unsafe levels of voltage course through single power supplies and substandard wiring. Often when this happens, the wiring is overburdened with a demand it cannot sufficiently supply. This can eventually lead to tripped breakers, blown circuits or even fire damage. 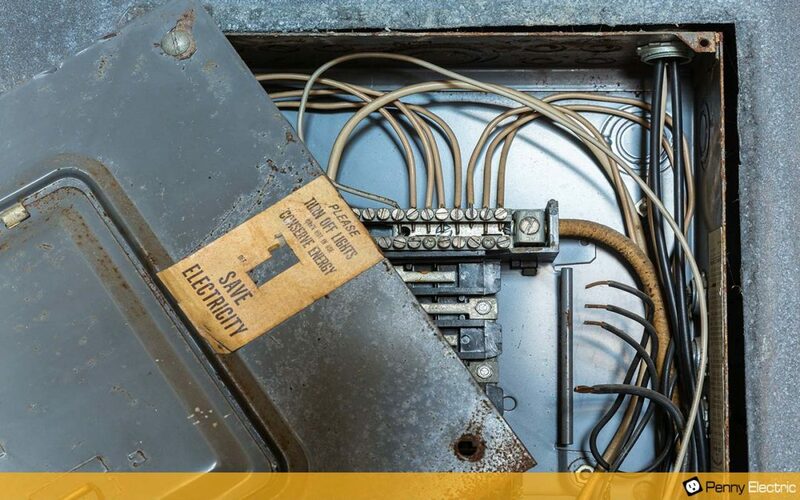 As with the rest of the wiring, those old circuit breaking panels may not be reliable enough to trust with the increased demand of modern families. If the outdated circuits fail to trip, that creates great danger for fire. Modernizing circuit panels on older homes will not only improve functionality of your home electrical, but safety. Another possibility to consider if your house is a noticeably older model is that it may have been built before city building codes mandated that electricians meet specific requirements in their work. If this is the case, the state of your electrical system could range from a well-done job to a dangerous mess! This also applies to any repairs that were done by a former owner or an uncertified electrician that a former owner may have hired. If wires are cobbled together, misdirected, or inadequate for the demand, it can cause frustration at best and electric fires at worst. If you own an older home, it would be wise to get a professional evaluation done on the status of your electric system. By having your home inspected, you can have confidence that it meets the standards ensuring the safety of your family. And if there is any possibility of selling your house in the future, keeping the electric circuits and wiring in good condition is a must! Penny Electric is a trusted Las Vegas electrician who has built a reputation for quality work and reliable service to both residential and commercial clientele, because we know the importance of keeping your home at its highest level of safety, efficiency, and functionality. We are also aware of the affects that our desert climate has on each component of the electrical system and what that will mean for your system in the future. Would you like to find out how you can experience the quality service and expertise of Penny Electric? Call us at 702-279-6040 or get a free online quote for your home today! Are Outdated Appliances Breaking your Budget? What Happens When Your House Gets Struck by Lighting? What Causes a Burnt or Melted Outlet?